As I said, I had not used their previous iterations, so I can’t possibly tell you how that was. 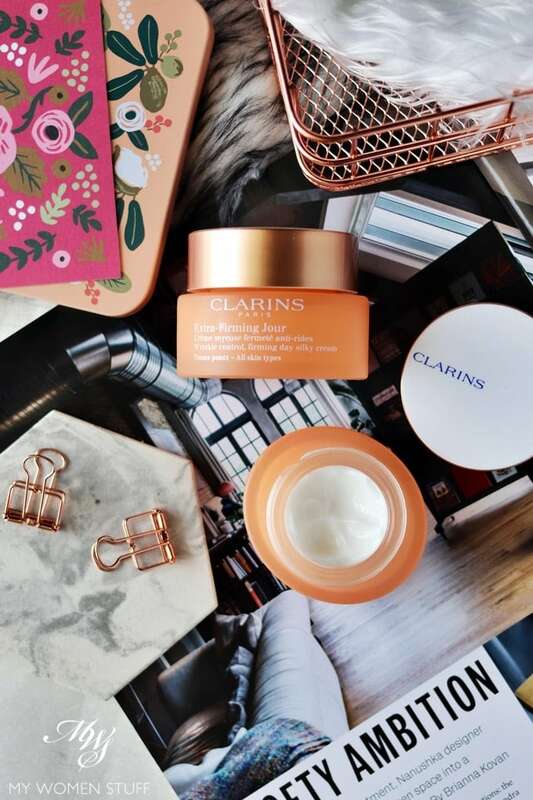 But what I do know is that 2018 heralds their 4th generation of the Clarins Extra-Firming cream, and this promises to be a better formula than before. Clarins says that they have identified what they call “youth reservoirs” which are clusters of young cells that promote skin regeneration and which, when they leave their reservoir, evolve into mature fibroblasts. As we age, these cells degrade and weaken. So, to boost their efficacy and regeneration, the key ingredient used is the “kangaroo flower” which helps maintain the fibroblasts and therefore skin firmness. I came away from the press preview with the Clarins Extra-Firming Creams for Day and Night in the formula for all skin types. Having dry skin, this was another reason I was prepared for this not to work for me. However, I was very pleasantly mistaken, as I found out about one and a half months into using these creams. The Clarins Extra-Firming Day Cream (All Skin Types) has a pale peach colour and a fairly light gel-cream texture. I use this in the day, and although I do have skin that tends to dry, I was surprised that it worked well for me. It sinks into my skin nicely, and importantly, my skin did not feel dehydrated during the day and it wore well under makeup. I do employ the moisture sandwich method, so perhaps that’s helped to boost my hydration levels. 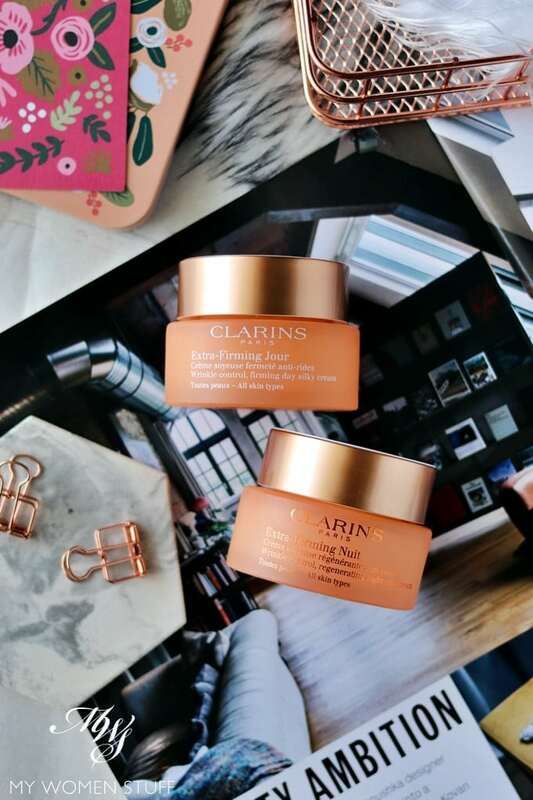 The Clarins Extra-Firming Night Cream (All Skin Types) is a white cream texture, that is thicker than the day cream, but not as thick as the one for Dry Skin. Based on memory, I do think that perhaps the Dry Skin version might be a little heavy even for me. This one is creamy, yet light, and absorbs nicely into my skin, keeping it moisturised through the night. I would note however, that I do use other serums and lotions alongside, but as a cream that seals my products in, it is very comfortable. Does the Clarins Extra-Firming Cream work? What about efficacy? Is my skin firmer? Is it more elastic? Are my cheeks lifted and my jowls gone? What do you mean by “work”? What I do know however, is that my skin is well moisturised throughout this period that I’ve been using these creams, and it feels soft and smooth (again remember, I use other products alongside). They absorb easily into the skin without leaving a residue, and in fact, feel very comfortable. I have not broken out while using this, and my skin seems to quite like it. The heavy, silicone feel of department store creams is gone, and these creams almost seem to melt into my skin. My dry skin is quite happy with the formula for All Skin Types, so I’d warn you that if you have oily skin, you might find the Night Cream a little heavy. 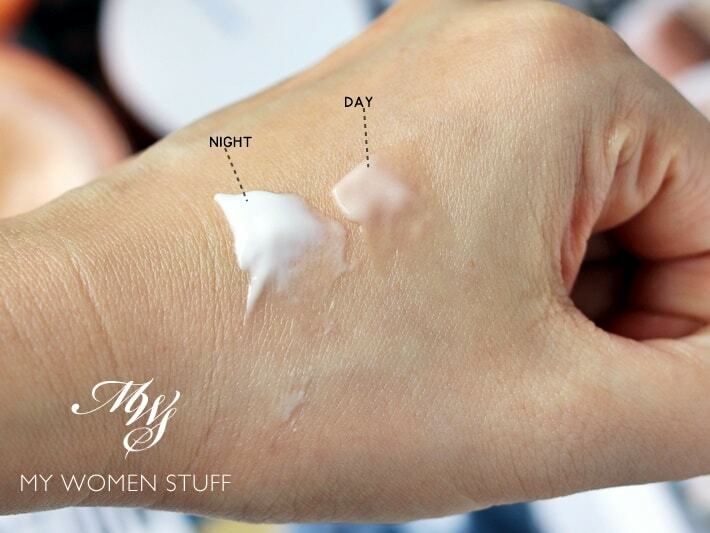 What you can do is just use the Day Cream for night as well. I don’t think there’s any reason you shouldn’t! 🙂 I will say however, that I do prefer this cream – texture and performance – more than the one I was using immediately before this, which was one by The Herb Farm. This feels better formulated, more comfortable, and my skin is very happy with it. 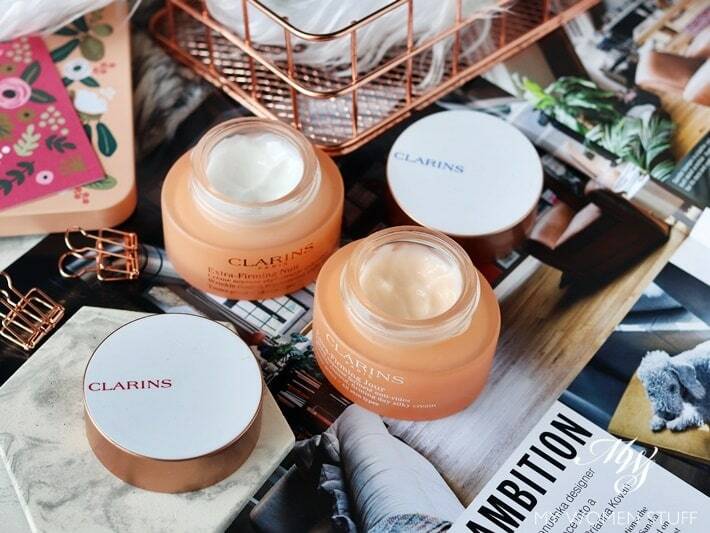 The Clarins Extra-Firming Creams were reformulated in 2018 and are in their 4th generation. There are 5 different variants for different skin types and requirements. The ones I tested were for all skin types. I’d personally say to try this if you want a nicely formulated cream that melts into your skin, does not leave a residue, and keeps your skin moisturised and comfortable all day and night. Over time and with dedicated use, it might even give your skin that extra firmness and spring associated with youth. But if you are sensitive to fragrance, then be warned that it is fragranced and that is something I wish Clarins would do without in a future iteration. 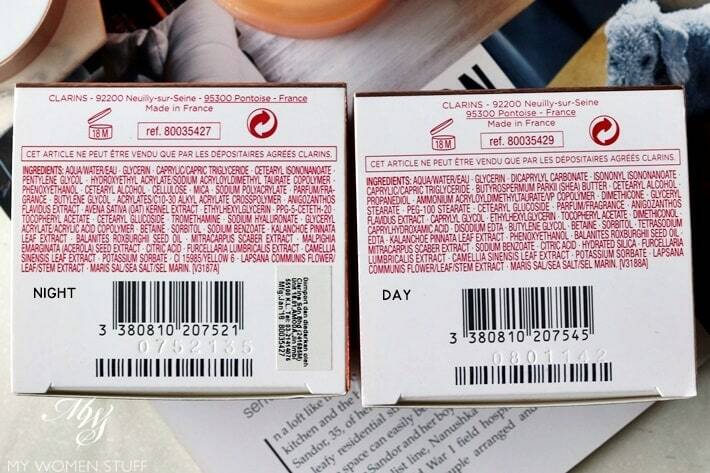 Here is the ingredient list for the Clarins Extra-Firming Day Cream and Night Cream (All Skin Types). Does this Clarins Extra-Firming cream interest you? If you’d like to try it, they also have a facial at the Clarins Facial Spa using these Extra-Firming creams. I haven’t yet tried it but hope to soon! Have you tried the previous version or do you use anything from Clarins? Disclosure: Featured products are gifts from a press preview for consideration. Our commitment is to honesty and fairness. For review guidelines please read the disclaimer. PREVIOUS POST: The Hourglass Illusion Hyaluronic Skin Tint was not love at first sight but I gave it a second chance for happy ever after! Glad it is moisturizing enough for dry skin and doesn’t cause you to break out. When I use basic skincare products, I don’t expect them to reverse sign of aging. I’ll be more than happy if they can slow down aging like providing hydration and spf. Of course, there are exceptions – I want specialized treatments such as vitamin c serum, retinol, glycolic acid etc to work lor. Haha the peach glass jar is pretty. But it bugs me that it’s oval so it doesn’t quite fit in containers LOL! It is quite good, and I’m quite happy using it still! Hope you tried the salmon patties over the weekend. I had some from my freezer a couple of days back and it was good! Ah…I didn’t even notice the jar is oval. Now I see it. I also don’t like cooked salmon. So that is a good way to eat it without the distinct fishy taste. Unfortunately, I can hardly cook. Oh wait, I can boil stuff. LOL! Like hard-boiled egg, noodles etc. Throw into the water and that’s it. One day, just one day, I’ll may get influenced by your cooking passion. Ha Ha.